Say "cockroach" and most people will start to squirm. These indefatigable insects are maligned the world over because of a handful of species that have settled in quite nicely among human habitats. The world of cockroaches is far more diverse than most even care to realize, and where they occur naturally, these insects provide important ecological services. For instance, over the last decade or so, researchers have added pollination and seed dispersal to the list of cockroach activities. That's right, pollination and seed dispersal. It may seem odd to think of roaches partaking in such interactions but a study published in 2008 provides some of the first evidence that roaches are doing more with plants than eating their decaying tissues. After describing a new species of Clusia in French Guiana, researchers set out to investigate what, if anything, was pollinating it. The plant was named Clusia sellowiana and its flowers emitted a strange scent. The source of this scent was the chemical acetoin. It seemed to be a rather attractive scent as a small variety of insects were observed visiting the flowers. However, only one insect seemed to be performing the bulk of pollination services for this new species - a small cockroach called Amazonia platystylata. It turns out that the roaches are particularly sensitive to acetoin and although they don't have any specific anatomical features for transferring pollen, their rough exoskeleton nonetheless picks up and deposits ample amounts of the stuff. It would appear that C. sellowiana has entered into a rather specific relationship with this species of cockroach. Although this is only the second documentation of roach pollination, it certainly suggests that more attention is needed. This Clusia isn't alone in its interactions with cockroaches either. As I hinted above, roaches can now be added to the list of seed dispersers of a small parasitic plant native to Japan. 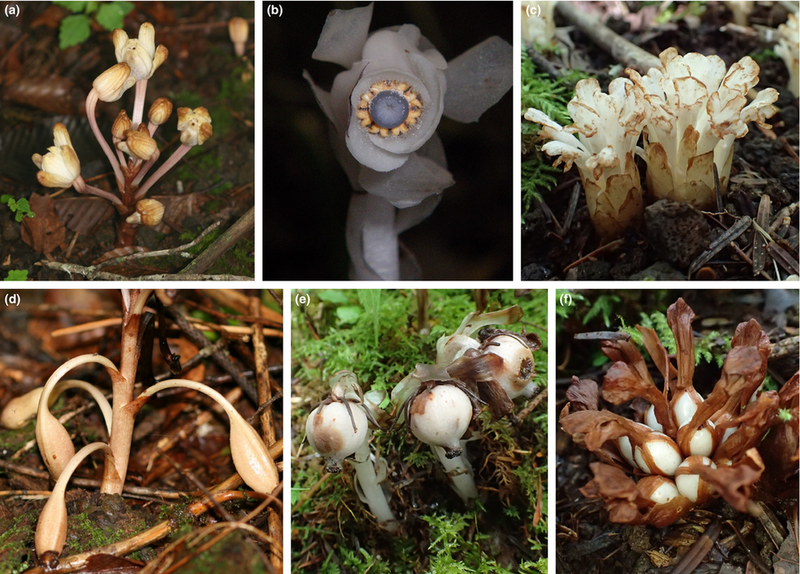 Monotropastrum humile looks a lot like Monotropa found growing in North America. Indeed, these plants are close cousins, united under the family Ericaceae. Interestingly enough, it was only recently found that camel crickets are playing an important role in the seed dispersal of this species. However, it looks like they aren't the only game in town. Researchers have also found that a forest dwelling cockroach called Blattella nipponica serves as a seed disperser as well. The roaches were observed feeding on the fruits of this parasitic plant, consuming pulp and seed alike. What's more, careful observation of their poop revealed that seeds of M. humile passed through the digestive tract unharmed. Cockroaches can travel great distances and therefore may provide an important service in distributing the seeds of a rather obscure parasitic plant. To think that this is an isolated case seems a bit naive. It seems to me like we should pay a little more attention to what cockroaches are doing in forests around the world. Who Pollinates the Flame Azalea? By and large, one of the most endearing aspects of doing research in Southern Appalachia are the myriad Ericaceous species you inevitably encounter. Throughout the growing season, their flowers paint the mountainsides in a symphony of color. One of my favorite species to encounter is the flame azalea (Rhododendron calendulaceum). This shrubby spectacle is a common occurrence where I work and its flowers, which range from bright yellows to deep orange and even red, put on a show that lasts a couple of weeks. It's not just me who enjoys the flowers either. Countless insects can be seen flitting to and from each blossom, sucking up rich reserves of nectar and pollen. It is interesting to watch a bee visit these flowers. Their outlandishly long anthers and style seem to be mostly out of reach for these smaller pollinators. Bees attempting to grab some pollen look outlandishly clumsy in their attempts. What's more, small insects only seem to be able to get either nectar or pollen on any given visit. Rarely if ever do they make contact with the right floral parts that would result in effective pollination. Indeed, I am not the only person to have noticed this. Despite being visited by a wide array of insect species, only large butterflies seem capable to pollinating the flame azaleas stunning blooms. The mechanism by which this happens is quite interesting. The reason small insects do not effectively pollinate these flowers has to do with the position of the anthers and style. Sticking far out from the center of the flower, they are too widely spaced to be contacted by small insect visitors. Instead, the only insects capable to transferring pollen from anthers to stigma are large butterflies. What is most strange about this relationship is that it all hinges on the size of the butterflies wings. Only two species of butterfly, the eastern tiger swallowtail and the orange spangled fritillary, were observed to possess the right wing size and placement to achieve effective pollination for the flame azalea (though I suspect other larger species do so as well). This is quite unique as this is the only report of wing-mediated pollen transfer in northern temperate regions. The research team that discovered this noted that pollen transfer was greatest with the eastern tiger swallowtail, which is a voracious nectar hunter during the summer months. Despite their popularity in pollinator gardens, butterflies are often considered poor pollinators. That being said, pollen transfer via wing surfaces has been a largely overlooked mechanism of pollination. Coupled with a handful of reports from tropical regions, this recent finding suggests that we must take a closer look at plant pollinator interactions, especially for plants that produce flowers with highly exerted anthers and stigmas. As the authors of the study put it, "transfer of pollen by butterfly wings may not be a rare event."